Host Yourself in the Eye of Harmony: Eye of Harmony Hosting Solutions, a non-profit web provider operated by Indelible Promotions (the group behind the "Day of the Daleks" conventions), is offering special hosting deals for Doctor Who websites. Visit www.eyeofharmony.co.uk for more information. Missing Pieces: As noted in Doctor Who Magazine, "Missing Pieces" is a large-format Doctor Who fiction anthology, sold as a charity fundraiser equally divided for the Downs' Syndrome Association and the Foundation for the Study of Infant Death. Edited by Mark Phippen (creator & co-editor of "Perfect Timing") and Shaun Lyon (editor of Outpost Gallifrey), the book features an introduction by Peter Davison, an afterword by Sylvester McCoy and original fiction by Colin Bakerand Wendy Padbury. Over 30 professionally-published Dr. Who authors have participated in the collection, including Peter Anghelides, Trevor Baxendale, Arnold T. Blumberg, Colin Brake, Simon Bucher Jones, Jonathan Blum, Daniel Blythe, Stephen Cole, Martin Day, Keith R.A. DeCandido, Steve Emmerson, Craig Hinton, David J. Howe, Paul Leonard, Steve Lyons, Paul Magrs, David A. McIntee, Jon deBurgh Miller, Jonathan Morris, Jim Mortimore, Lance Parkin, Lars Pearson, John Peel, Gary Russell, Rob Shearman, Cavan Scott & Mark Wright, Dave Stone, Keith Topping, Mike Tucker and Nick Walters, as well as many prominent fan authors and illustrators. 380 pages, full color cover art by artist Nathan Skreslet, perfect bound. Ordering information is now available, visit http://www.gallifreyone.com/pieces.htm. The book was launched at the Gallifrey 2001 convention; the first group of 250 orders has been fulfilled, and the second batch is currently being shipped. A third batch is planned for the summer. Walking In Eternity: A new charity fiction anthology edited by Julian Eales, with contributions from Doctor Who authors Stephen Gallagher ("Terminus" and "Warriors' Gate"), Paul Magrs, Mark Clapham, Simon Bucher-Jones, Mark Michalowski, Kelly Hale, David Bishop, Jon DeBurgh Miller, Lance Parkin and Dave Stone plus many other authors. The book is a new benefit collection for the Foundation for the Study of Infant Death. For more information, emailwalkingineternity@ntlworld.com. Time Space Visualiser 62: The latest issue of TSV is now out, and features a whole host of features, including an interview with Colin Baker, the first part of an interview with Big Finish producer Gary Russell covering the McGann stories and more, Andrew Pixley examines cut scenes from the Spearhead from Space camera script, the first of a three-part tenth anniversary overview of the New Adventures, the Beyond the Sofa boys reappraise The Tenth Planet and Attack of the Cybermen, the Pertwee era reviewed, the Karkus takes on a War Machine and Pex finds out the truth about Cyberleader Krang... all this and more in this 92 page A5 zine from the New Zealand Doctor Who Fan Club - available to fans worldwide. For ordering details, visit www.doctorwho.org.nz. The McGannzine: Everything you could want to know about the Big Finish Eighth Doctor audios and more... in a new UK fan magazine. "The McGannzine" features interviews with all of the writers of the first Eighth Doctor series, India Fisher and Michael Sheard; the original plans for a companion - named Kirsty; which story had a working title; how the final cut of a story is assembled; how covers are designed; and much, much more, in 40 A5 packed pages of fanzine fun! Order information is available via email to univex@ksmith.demon.co.uk or, for more information, write Kenny Smith, 15 Burncleuch Avenue, Cambuslang, Glasgow, G72 8NU UK. Eye of Orion 7: After a slightly longer hiatus than the editors intended (although not quite as long as the 1985/86 one in the series), EYE of ORION issue #7 is now available. There's the continuation of the comic strip, written by Paul Castle and drawn by Alex Naylor as well as fiction by Jonathan W Dennis, Helen Fayle, Alison Jacobs and Mark Phippen. Features include reviews of _The Cat Who Walked Through Time_ and the first year's Big Finish output. Phil Pursar-Hallard examines the EDA's 'Compassion Arc' and articles by Matt Michael and Simon Bucher-Jones looking at two different aspects of _The Twin Dilemma_. Plus the EYE's readers discuss whether DOCTOR WHO is still a unified series, and our usual variety of drabbles and more. Issue #7 is 48 pages, A5, b&w. A full listing of the main fiction and articles can be found at our new website: www.eyeoforion.plus.com. Trenchcoat Finale: The Trenchcoat Farewell Project -- started to close the book on the ten-year-old Trenchcoat/Ninth Aspect fanzine series -- will reprint and remaster the 33 alternate eighth and ninth Doctor stories in the five published fanzines plus eleven other stories that would have appeared in two additional issues that were never finished. With redone artwork, the issue will be released as a single, 800 page hardbound volume; the Project hopes to see release this coming September. For more information, visit www.sitehouse.net/trenchcoat or email jamesbow@home.com. Ten Years of Doctor Who Novels: A special issue of Enlightenment, the fanzine of the Doctor Who Information Network. "Commemorating the 10th Anniversary of the publication of original Doctor Who novels (in the New Adventures and the Eighth Doctor Adventures), this extra-sized edition, features year-by-year reviews of the past decade's books by some of North American Who fandom's best reviewers; a look at some of the strengths of the series; an assessment of the Seventh Doctor's character as portrayed in the New Adventures; an analysis of the effect the books has had on fan fiction; and an interview with author (and future Enlightenment columnist) Lance Parkin. You're not likely to find this much coverage of this event anywhere else this year!" For more ordering information, email ggburk@aol.com. The Six Minute UNIT Files: The Curse of the Vampire: The latest Six Minute Movie (a series of 6-minute fan videos) is from BTR Productions, an Australian group. "After hearing disturbing reports from a "friend of a friend" of unearthly occurrences, Professor Jennifer Langard and Captain Rainor Vance of the United Nations Intelligence Taskforce decide it's time these reports were investigated...." For more info, or to view it online (at a site hosted by the Federation), visitfedvideo.net/6m2/unitcurse.htm. Calling All Researchers! : Paul Vanezis of the Restoration Team has put out the following call for action: "I've had a message that Patrick Troughton episodes were screened on Channel 9, a CBS affiliate in Washington DC in the late sixties/early seventies. The report comes from someone who remembers seeing 'The Wheel in Space' after school (round about 4pm)and that Gilligans Island re-runs had just been introduced. The person also remembers that these programmes were replaced with an afternoon film some time later, one of which was 'The Creature from the Black Lagoon'. Are there any US TV researchers out there who have access to TV listings from around about then? We're talking about 1969, possibly 1970. It's also worth pointing out that I have contacted the TV station (now WUSA-TV) who say they did not screen the episodes and do not have any copies. Also, our scant records indicate that the series was not sold to this market at that time." If you have any information that can be provided to the Restoration Team, please visit the Restoration Team Discussion Forum. Blackstar Video Promotion: UK video retailer Blackstar is running a special Doctor Who promotion with reduced-rate Doctor Who titles selling for the low price of only £7.99. The stories on sale include An Unearthly Child (remastered edition), The Edge of Destruction/Original Pilot, Carnival of Monsters, Horror of Fang Rock, The Face of Evil, Nightmare of Eden, Time Flight, The Greatest Show in the Galaxy, Silver Nemesis and Battlefield as well as The Colin Baker Years and More Than 30 Years In The TARDIS. Click on the graphic to visit their site! More Rumors About New Series Persist: Rumors are flying concerning possible plans for a new Doctor Who series. Outpost Gallifrey confirmed in late May that at least one proposal had been submitted to the BBC by a name fairly well-known in Doctor Who circles of late, and that the proposal was specifically requested from this individual by internal BBC executives. Dan Freedman, the person behind the "Death Comes to Time" BBC Radio proposal, has revealed little information other than vague hints on the BBC's official site discussion forum, though it has become fairly well known now that Freedman is indeed behind one of these proposals. Meanwhile, SFX magazine reports in their newest issue that they have heard rumors about a possible revival of the series timed to coincide with the series' 40th anniversary in the fall of 2003. SFX makes note that some BBC officials have been well aware of the interest surrounding possible plans for a film project, while at least one report out of the BBC suggests that they have become aware of the apathy about a film (as opposed to a series). What is certain is that the BBC is planning something to mark the anniversary, though what sort of event this ultimately turns out to be is uncertain. We'll keep you posted. Here We Go Again...: Various internet sites are reporting that a Doctor Who film announcement may be imminent, based upon a variety of purely coincidental happenings. First, the BBC Films bureau announced at Cannes in early May that they had secured over 100 million pounds for funding of several big-budget film projects, though Doctor Who was never specifically mentioned, and that they had secured film deals with Cobalt Media Group. Cinescape Online recently featured a story which suggested (based, as far as we can tell, on earlier rumors) that this might include Doctor Who. 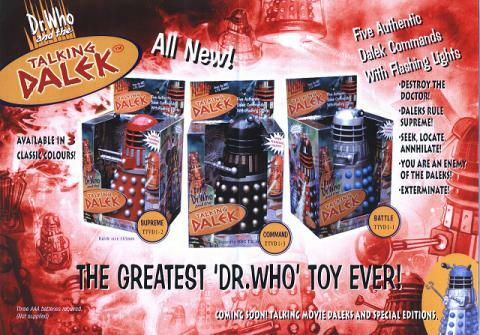 The reports (erroneously) state that Doctor Who toy merchandiser Dapol has been instructed not to release any new merchandise (stating that, coincidentally, this same sort of thing happened before the 1996 TV movie) but Dapol has denied this; see "Miscellaneous" below. We stress that (a) yes, we've heard all of this, and (b) we've heard it before; see the report "And Yet... It May Happen" below. Cover Redesign? : A redesign of the BBC books' covers in the near future is now inevitable. BBC Worldwide wants to revamp the covers to bring them more in line with the DVD covers (which, by reactions elsewhere on the web, are almost universally hated). This report is confirmed in Doctor Who Magazine #299, which states that the covers will be changing beginning with the April books, though we have received word that this is not the case, and instead will be featured later in the year. "Eater of Wasps" was supposed to feature the new book design, however, the regular artwork has been seen for it. Indeed, preliminary cover art sent to authors for books in release later in 2001 feature the same design as before, and our best information suggests that if it does happen, which seems likely, it wouldn't be until late in 2001 at the very earliest. We can also tell you that editor Justin Richards and associate editor Jacqueline Rayner have no input on this, so emails of complaint to BBC Books apparently will do nothing, sorry! Though other pages have stated that their sources claim that this is not happening, we have been informed by BBC Books that it is. Stay tuned. The Five Missing Books: Five Doctor Who novels from BBC Books went unreleased in 2000 due to computer glitches at the North American distributors, London Bridge: "The Ancestor Cell," "The Burning," "Heart of TARDIS," "The Banquo Legacy" and "Prime Time". After repeated delays, London Bridge assured retailers that these books would be released in 2001. The impasse seems to be subsiding as "The Banquo Legacy" is now available to retailers and is being seen in shops across the US. Further rumors of delays -- including an error on Amazon.com that suggests that "The Quantum Archangel" is not available until December 2001 in the US and Canada -- are incorrect, as all BBC books to the February installments ("Escape Velocity" and "Archangel") have been released. Meanwhile, author Dave Stone has taken the ball, so to speak. "Free the Fatal Five" T-shirts and other merchandise are now available via the CafePress website, with a logo created by Stone (the author of one of the five books in question, "Heart of TARDIS"). As of April 27, all five books are now widely available in North America. And Welcome "The Near-Fatal Sixth": "The Shadow in the Glass", the April 2001 BBC Past Doctor novel by Justin Richards and Stephen Cole that was a last minute replacement for Gary Russell's delayed "Instruments of Darkness" has ended up caught in the paperwork crossfire in North America. London Bridge was informed by Ken Barr of Ambrosia Books that the novel's release had occurred in Britain; the London Bridge retail representative corrected the release date -- to a fashion. Retail outlets are now able to order the book as of April for a limited time; however, after early May, the book will be withdrawn and held to its new "proper" release date, July 2001. If you wish to receive this book in April, your local bookstore can order the book with the ISBN number: 0563538384; tell them it is not listed in Books in Print but is available for order from the London Bridge distributor. Author Paul Ebbs joins the BBC Doctor Who author stable with The Book of the Still, the May 2002 Eighth Doctor novel. Says author Ebbs, "Can't say too much about the contents, except to say that in part the synopsis describes itself as 'John Woo directs Hello Dolly.' Its set in a far flung decadent system where the imperative is partying. There'll be lots of bangs, flashes and musical numbers - I hope people will think its a lot of fun." David Bishop, author of the long out of print Virgin 'sidestep' novel "Who Killed Kennedy," debuts in the BBC range with Amorality Tale in April 2002. Featuring the very seldom-used combination of the Third Doctor and Sarah Jane Smith (set during Pertwee's final season), the novel is set in London during December 1952. Jonathan Morris ("Festival of Death") authors his first book in the Eighth Doctor series, Anachrophobia, set for March 2002. Lance Parkin pens his second Eighth Doctor book, Trading Futures, in April 2002. Paul Magrs returns for yet another BBC book with Mad Dogs and Englishmen, the January 2002 Eighth Doctor adventure. (We assume that this will be his first without his longrunning character Iris Wildthyme.) Says DWM, Magrs has made it a condition of his contract that a fluffy poodle with a pink collar should appear on the cover! Two new authors have joined the BBC fold. Simon A. Forward (who wrote "One Bad Apple" in "More Short Trips") is the author of the February 2002 Past Doctor adventure, Drift, a Fourth Doctor story. And Mark Michalowski (author of "Digging Up the Past" in the short-story collection The Dead Men Diaries for Big Finish), has penned Relative Dementias, the BBC Past Doctor novel for January 2002. Michalowski told Outpost Gallifrey: "It's a 7th Doc/Ace story set in Scotland... The Doctor has to contend with mad aliens, something at the bottom of the sea, and some unpalateable truths about UNIT, whilst Ace takes things into her own hands and finds herself stalked by a shadowy figure." Jon de Burgh Miller, co-author of the final Virgin Benny Summerfield series novel "Twilight of the Gods," joins the BBC Books' contingent in October with his first solo sale, Dying In The Sun, a Second Doctor, Ben and Polly novel set in Hollywood in the 1940's (not 1930's as other press has stated), and featuring an "alien infiltration" plotline. Steve Emmerson ("Casualties of War") has sold his second Eighth Doctor novel, Dark Progeny, set for release in August 2001. Controversial author Lawrence Miles ("Interference") returns to the BBC Books fold (after a fairly publicized earlier departure) with an Eighth Doctor novel taking the November 2001 slot. The working title for this book was "The Napoleon of Beasts" but the actual title is The Adventuress of Henrietta Street. (The official BBC site reports it as "Adventures" but BBC Books editor Justin Richards gave us the correct title.) In a statement posted on the Jade Pagoda list, Miles commented on the name: "Streets don't have adventures. That would be silly." Furthermore, Miles said jokingly that, contrary to the comment on the back cover about his story "Vrs" in the volume being the 'last ever Doctor Who fiction by Lawrence Miles,' "feel free to complain to BBC Books, who are in this case the culpable party." Meanwhile, Miles has solicited questions for another interview on his website, www.menace.ndo.co.uk. Gary Russell's Instruments of Darkness has been pushed back to November 2001 due to other commitments by the author (such as the hefty Big Finish schedule). Kate Orman returns to the Doctor Who fold with June 2001's The Year of Intelligent Tigers, an Eighth Doctor book set on an Earth colony and featuring, as the title suggests, talking alien tigers. Meanwhile, Trevor Baxendale, as previously reported, pens Eater of Wasps, an Eighth Doctor book due for release in May 2001 and set in a quiet English village with mayhem, murder and wasps. "On 49th-century Earth, mankind has developed time-travel technology, and a government security force controls illegal time jumps. But a devastating weapon is accidentally sent back through time to Wiltshire 1934, if unrecovered, the consequences are unthinkable." Gary Russell returns in November 2001 for "Instruments of Darkness", the 'third and final' part of the loose 'trilogy' of his books from the Sixth Doctor era (including "The Scales of Injustice" and "Business Unusual"), featuring Melanie and a special guest appearance by Evelyn Smythe, the new companion character created for the Big Finish Doctor Who audio line. Paul Cornell's first original novel, "Something More," published in the UK by Victor Gollancz, will see release on June 21. David McIntee was recently married to Lesley McIntee in a ceremony at the Redemption 2001 convention; actor Michael Sheard (many Who roles) was the best man. McIntee's first original novel "Knight Sky" will be out around Easter 2002. McIntee is also currently penning a BBV audio and a novel trilogy using the character Guy de Carnac from his Virgin Dr. Who novel "Sanctuary". Peter Anghelides has just opened up his new website at anghelides.org, which features a section for each of his published books, the illustrated story of the Frontier Worlds cover, "How I Wrote My First Novel, Kursaal" and much more. David J Howe has just finished putting the finishing touches to a new horror anthology based on the acclaimed Channel 5 series Urban Gothic which is due to be published in April. The book includes original stories by Graham Masterton, Simon Clark, Christopher Fowler and others as well as an introduction by Richard O'Brien. More info at www.telos.co.uk. David is also commissioning for the second volume of the Dark Fantasy anthology F20, due for publication in September. Authors this time include Storm Constantine, Jane Welch, Freda Warrington, Juliet E McKenna and Louise Cooper. Keith Topping's revised section edition of "Slayer," the unofficial (but wonderful) guide to "Buffy the Vampire Slayer" is now hitting bookstores; Topping has also sold a second edition of his "Angel" guide "Hollywood Vampire" due in December 2001 and a third edition of "Slayer" for early 2002. Also, "High Times," Keith's unofficial guide to "the hit TV series Roswell" is released in October in the UK and December in the US. Terrance Dicks' latest children's book is "The Nazi Dagger Incident", published in Jan by Piccadilly Press. Lance Parkin's second "Emmerdale" book, "Emmerdale: Their Finest Hour" (Granada Media), is due 4 Jun in the UK and set in WWII. A revised and updated edition of Keith Topping's unofficial "Buffy the Vampire Slayer" guitde, "Slayer" (Virgin), is due 8 Mar in the UK. Jac Rayner's "Pet Rescue: Horses Like Blaze" (Ladybird Books, edited by Steve Cole), due 31 May in the UK, is a children's book for the under-nines about keeping horses, a tie-in with the Channel 4 series "Pet Rescue". Justin Richards' "Knock! Knock! Joke Book: Blue Door" (Ladybird Books, edited by Steve Cole), due 1 Mar in the UK, is a children's joke book. Martin Day continues to write for the Channel 5 (UK) soap "Family Affairs". Episodes so far this year are #1002 (broadcast 30 Jan) and #1018 (21 Feb). Keith DeCandido ("Decalog 3") has written the third "Farscape" novel, "Farscape 3: House of Cards" (Boxtree), due 23 Mar in the UK and in May in the US. The previous "Farscape" novel, "Farscape 2: Dark Side of the Sun" (which has yet to be released in the US) was written by Jim Mortimore (under the pseudonym Andrew Dymond). Jack Watling, father of actress Deborah Watling (Victoria Waterfield) and Doctor Who guest actor (as Professor Jack Travers in "The Abominable Snowmen" and "The Web of Fear") died on May 22. Watling, a long-serving actor in British film and television, had been battling cancer. A family spokesman has asked that any condolence letters to Debbie Watling and their family be sent to debwatling@aol.com and that they will be passed on as soon as possible. Tom Baker's brand new-look website recently relaunched. You can visit it at www.tom-baker.com. There's a fairly active message board, a fan area, merchandise and more. Douglas Adams, former screenwriter for and script editor of Doctor Who and the author of The Hitchhikers Guide to the Galaxy, one of the most prominent and best-loved science fiction satires in modern literature, died on Friday, May 11 of an apparent heart attack after collapsing at a gym near his home in Santa Barbara, California. The man who brought the very familiar concepts of "42" as the answer to Life, The Universe and Everything, the Infinite Improbability Drive, Milliways and Earth's status as mostly harmless, "was not ill," Elizabeth Gibson, a family friend, told the Associated Press. "This was completely unexpected." Adams' most famous creation began as a BBC radio series in 1978; twelve episodes were produced with the irascible Arthur Dent, ex-president Zaphod Beeblebrox and aloof Ford Prefect. The radio series later was adapted to television as well as into a novel, which sold 14 million copies around the world; four additional sequels were written by Adams -- "The Restaurant at the End of the Universe," "Life, The Universe and Everything" (which had started off as a concept for a Doctor Who proposal, "Doctor Who and the Krikketmen"), "So Long and Thanks For All the Fish" and "Mostly Harmless" -- as well as a best-selling Infocom text adventure for the computer in the 1980's and a plethora of media tie-ins. Earlier, Adams had penned the Doctor Who story "The Pirate Planet" starring Tom Baker which had opened doors for him at the BBC; he later joined the series as its script editor during the 17th season and wrote the screenplays for "Shada," the untransmitted story from the tail end of that season, as well as "City of Death," arguably one of the most popular stories of the entire run of the series (and also, according to viewing figures, its highest-rated ever.) Geoffrey Perkins, the BBC's head of comedy, told the Associated Press that Adams was "absolutely one of the most creative geniuses to ever work in radio comedy... He probably wrote one of the greatest radio comedy series ever, certainly the most imaginative." Adams was born in Cambridge, England in 1952 and worked both on many high-profile and long-forgotten serials. 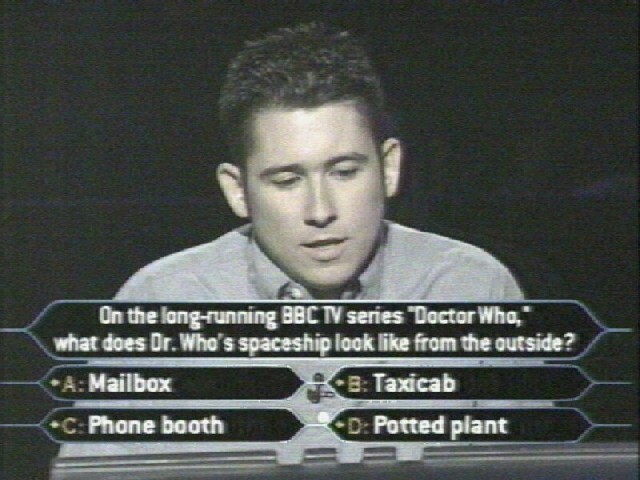 He followed "Hitchhikers" and his stint on Doctor Who with "Dirk Gently's Holistic Detective Agency" and "The Long Dark Teatime of the Soul" featuring new characters (though parts of the stories were borrowed from his earlier Who stories); a book about endangered species, "Last Chance to See"; and with John Lloyd, the alternative dictionary "The Meaning of Liff". Adams also founded a multimedia company called Digital Village, for which he created a computer game, "Starship Titanic". Adams had been working on and off for several years on a "Hitchhikers" feature with director Jay Roach ("Austin Powers") and was a fervent supporter of the Macintosh computer, as he had become a spokesperson in later years. He is survived by his wife, lawyer Jane Belson, and six year old daughter Polly. Science fiction fans across the world -- including this editor, a huge fan of his works -- mourn his passing. Sophie Aldred is opening her own website at www.sophiealdred.com - it's nothing but a title page now, but will feature all sorts of things in the months to come including the pilot trailer for "Death Comes to Time". Possible 2002 Audio Releases: Additionally, according to the BBC's official website, the following stories are under consideration for release in 2002: "The Space Pirates," "Enemy of the World," "The Evil of the Daleks," "The Wheel in Space" and "Marco Polo" (which may be on the schedule for later in 2002; no official confirmation has been forthcoming).